A US release may be on the way in August. The latest set from Samsung was designed to satisfy those who want their 3D televisions to be big and can afford to pay a little more for the luxury of having the biggest screen around. The D9500 is a 75 inch set with LED backlighting and 3D capabilities. It's the biggest of its kind, but it's more than just a big screen. 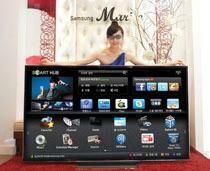 The 9500 packs Smart TV features that allow streaming of video and audio content. Samsung's D9500 is set to sell for 19 million Korean won, which comes out to around $18,000. According to Engadget, the set will only be a Korean exclusive for a short while - America will get the set in August at a more reasonable but still very expensive $13,000.